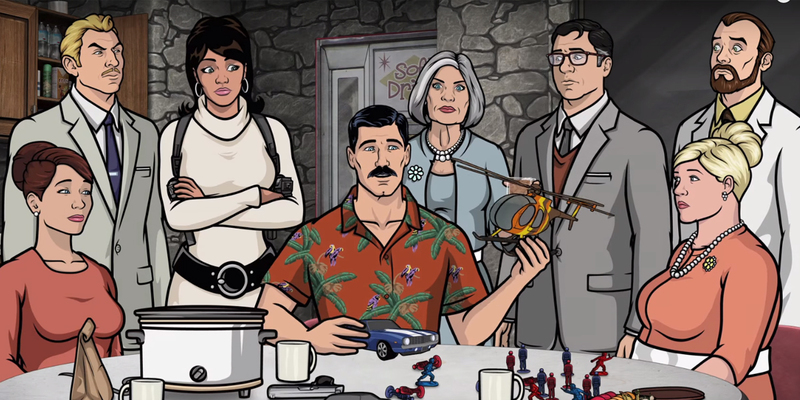 Until recently, the future of Archer, the FX animated spy comedy series with a small but relatively rabid cult following, was somewhat in doubt. Having aired seven seasons since its debut in 2010, the show finished its most recent season with a cliffhanger - and without a renewal. In early June, two producers of the show gave an interview in which they were uncertain about whether Archer would return- and even mentioned, in lieu of a new season, the possibility of pursuing a live-action movie starring Jon Hamm as Sterling Archer. But now, it sounds like that movie is going to have to wait. This is good news for Archer fans, as the series hasn’t shown much sign of decline and has already successfully reinvented itself three or four times. Its premise is strong enough to sustain many more years - even if it doesn’t pivot into the characters turning into drug dealers, or private detectives, or something equally outlandish. And FX and its sister network FXX have found a way to make comedies like the 11-year-old It’s Always Sunny in Philadelphia survive and thrive for longer than the typical lifespan, while also keeping the entire core cast and creative team together. On the other hand? That Jon Hamm movie idea would’ve been a lot of fun. Hopefully it remains a possibility at some point in the future. And Archer fans will have to make do with only eight episodes per season; every year of the series to date has had 13 episodes, except for the first, which had ten. Season 8 of Archer will premiere on FX in 2017.